While they don’t feature on the Australian flag, green and gold are the country’s colours when it comes to sport. First adopted by the country’s cricketers in 1899, they were donned by Australian Olympians in 1912 and the football/soccer team followed suit in 1924, a few years ahead of rugby league and rugby union. Light blue had been used by the football team before then. 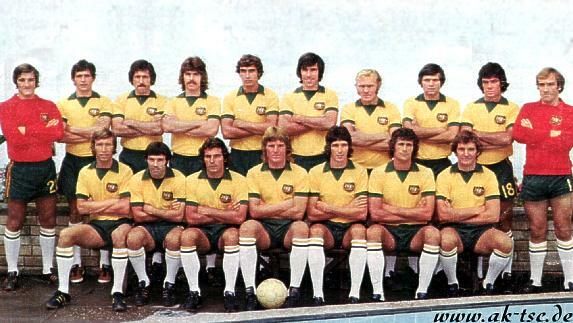 In 1965, white socks were adopted and would remain until 1989, a period taking in the Socceroos’ first appearance at the World Cup in 1974. A classic 1970s style v-neck insert collar was used at the time, but there would be a few notable changes for the tournament in West Germany. You’re not seeing things – that kit does indeed have the Umbro double diamond and adidas’s famous three-stripe sleeve markings. Thanks to Simon Shakeshaft, we know that adidas had an agreement with FIFA to underwrite the costs of the World Cup and showcase their new branding. The Australian Soccer Federation had a deal with Umbro, who were in league with adidas at the time. They were the German firm’s sole footwear distributor in the UK while providing textiles expertise in return. Adidas wanted a presence in the Australian market and the shirt three stripes gave them a profile. The shirt was actually an Umbro airtex jersey carrying the double-diamond logo with three stripes added down the sleeves – in contravention of the rules for the competition, which stated that only type of brading was allowed on each kit element. Special permission was granted to Australia and Umbro took inspiration with their own diamond sleeve taping later in the decade. For the game against Chile, who also had white socks, Australia switched to green hosiery. The campaign for white socks to return was started in the Sydney Morning Herald in 2011, and they did for the 2014 World Cup. However, it was the ‘proper’ Umbro style that Nike replicated rather than the adidas/Umbro hybrid.